From March 11 – 18, the American Film Institute will be hosting the 12th annual New African Film Festival This year, twenty films from fifteen different countries will be shown, including a very special screening from Niger. Descriptions of these films can be found on the AFI website, but all are meant to celebrate the unique cultures of Africa. Featured this year is the Nigerien RAIN THE COLOR BLUE WITH A LITTLE RED IN IT, a musical drama that tackles the ambitious goal of borrowing the stylistic musings of Prince’s 1984 classic PURPLE RAIN. Featuring stunning musical performances from Mdou, the film tells the universal story of a rock star trying to overcome jealous competitors, family conflicts, the trials of love, and even his own hubris. This one-night event plays on Friday, March 18, at 7:15 PM. The screening will take place at the AFI Silver Theatre and Cultural Center in downtown Silver Spring, starting on Friday, March 11 at 5:00 with the Ethiopian film LAMB. Tickets will be $13 for adults (with special rates for seniors and children), and can be purchased either online here, or in-person at the AFI Silver box office. The Camel Express, a.k.a the CEX, began 37 years ago as a newsletter typed and photocopied in Niger, then distributed to volunteers around the country. These were the days long before the Internet made it easy to get any kind of information delivered to your banko hut. 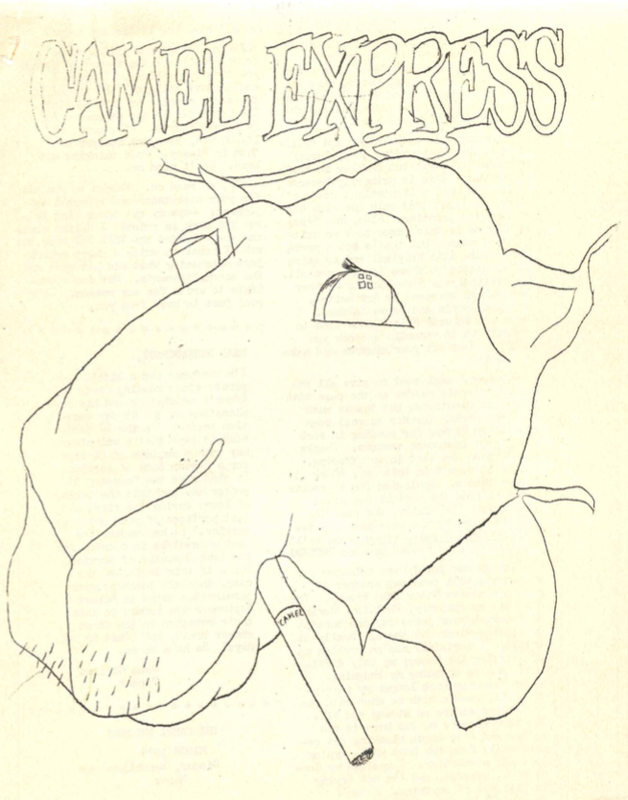 We recently posted the first issues of the Camel Express in our CEX Archives. Beginning with the first issue from January of 1979, we have 14 issues scanned into PDFs in all their original glory. News, stories, health tips, Hausa lessons, humor, recipes, artwork, puzzles, and games: it’s all there. Over the years the CEX, and then our web site and FON Facebook page, has turned its focus to communicating with the entire membership of the Friends of Niger, but it’s fun to stop and look back at where it all began. Enjoy your little trip down memory lane! If you have any print issues that we’re missing and would like to share we’ll gladly scan and share them with everyone. Send us a message! A country’s economic development depends on its institutions: its system of government, property rights, land tenure, civil service, and justice. The Inter-Parliamentary Union notes that “In any State the authority of the government can only derive from the will of the people as expressed in genuine, free and fair elections held at regular intervals on the basis of universal, equal and secret suffrage”. What are causes, consequences, and lessons of a breakdown in the electoral system? Elections are scheduled in Haiti and Niger in the very near future but the campaigns are far from free and fair. In this seminar Dr. Gladys Melo-Pinzon reviews the situation in Niger, and Kim Ives considers the case of Haiti. Dr. Gladys Melo-Pinzon is the Senegal / Niger Country Specialist of Amnesty USA (AIUSA), the Amnesty International’s Section in the US and part of the global movement of people fighting injustice and promoting human rights. Kim Ives is a journalist, broadcaster, documentary filmmaker, and an editor with Haiti Liberte. Wells4Wellness, a nonprofit organization dedicated to bringing safe, sanitary water wells to the people of Niger, Africa, is holding a spring walk event fundraiser. The Moline-based organization is hoping to raise enough funds to add to the drilling of the next group of 6 wells. The fundraiser kickoff event is scheduled for Sunday, March 6 from 6 to 8 p.m. at Milltown Coffee, 3800 River Drive, Moline. Guests will sample American and Niger food and desserts, as well as enjoy entertainment and a silent auction. Walkers and walk teams may obtain walk information there. The event is free. Wells4Wellness is encouraging Quad Citians to walk 10,000 steps per day and pledge pennies towards accumulated miles. Teams are challenged to cumulatively complete a 6,000 mile walk to Niger. Faith Lutheran Church, Moline, and the Reverend Mark Gherke and Parish Nurse Barb Marlin are the first walk team to sign on. A former nurse turned Executive Director for Wells4Wellness, Pat Herath, Moline, says her many health missionary trips convinced her to help the people of Niger. “There, a child dies every 20 seconds from the effects of contaminated water. Drilling modern wells has a dramatic impact on the health and commerce of the people living in these rural desert communities,” she said. Wells4Wellness is a nonprofit 501(c)3 organization dedicated to improving the health of rural Niger, Africa by drilling modern water wells. The organization has a goal of drilling 33 wells to help the people of Niger gain access to clean, safe drinking water. For further information, please visit www.wells4wellness.com or phone 309-236-1301.